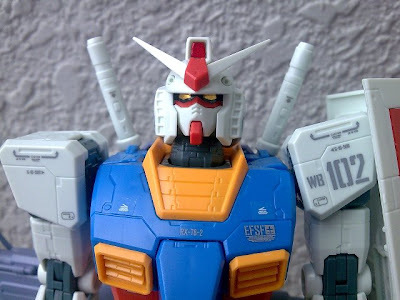 That means the RX-78 Gundam design is in accordance to the Katoki design. Talking about the differences between OYW and Vr. Ka - the easiest one to spot is the Beam Saber part at the back. The Katoki version have that long thing - something like an athenna or something on the Beam Saber handle. The box is quite huge for a 5 inch figure (almost at the same scale as 1/144 HG kits) - nonetheless it's the extra accessories and armament that make you wanted to buy this item. The next one that I'm interested to get is GFFN Aile Strike Gundam - though I know this is damn expensive 6,800 yen (about SGD 104.00) plus maybe shipment cost around SGD 40.00 to SGD 50.00 but somehow I love Aile Strike Gundam and I believe many other modern viewer feel the same (specially those Cosmic Era fans like me) and also in my opinion that is what Bandai still produce this model in GFFN now - about 6 or 7 years after the anime first aired in Japan and maybe the rest of the world. By the way this GFFN Aile Strike Gundam that I want is at around 20cm tall (about 7 to 8 inch) - almost the same as MG 1/100 kits. All those extra decals/markings is really the insignia of Hajime Katoki. I am quite happy with all the details presented on this figure. OK, let's check out the body again with the (almost) full armor. And a little bit more of posing.... damn to heavy... this is why I never like Heavy Weapon System... 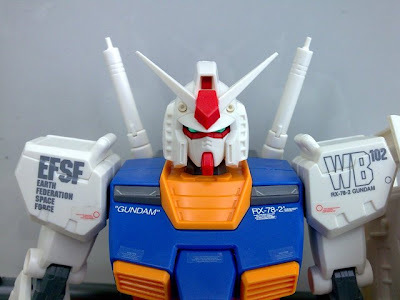 I prefer agility and mobility... but this is GFF RX-78 Gundam Full Armor and that "Full Armor" is the extras that you wanted when you buy this unit. Overall, unless if you share the same interest of great looking Gundam, it's quite difficult for me to recommend this GFF to you. It is really intended for serious and matured collectors. However, if you seriously wanted the beauty of the GFF and can tolerate the weakness that comes with it and if you can afford the hefty price, then why not, you should get at least one of them.